When I arrived to my hotel it was already daylight and it was hard to fall asleep. 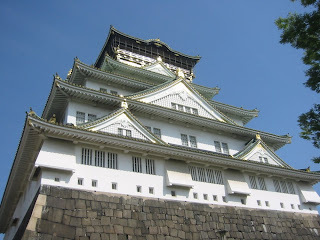 After sleeping a few hours (see my eyes in the picture above :D), I got up and went to see the famous castle of Osaka. 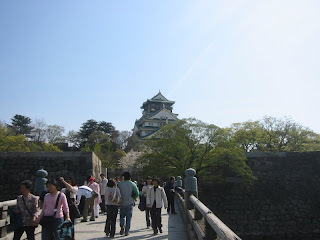 The castle has been restored recently and it is one of the most important buildings of Japan. 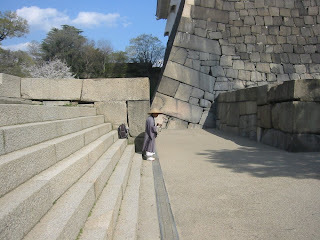 There were a lot of tourists there and I saw some Japanese monks or pillgrims asking for some money. Back to my hotel, I got in contact with the Spanish guy from Sevilla that I met in Tokyo (see day 1) through an Internet forum. 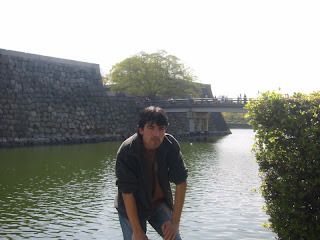 He was also in Osaka and was looking for someone to go out with. I met him in the same disco, Pure, where I also found the guys from Toyota. As it was Saturday, the disco was very lively, full of people and there were some gogos (I saw the black woman in blue and the guy with the tattoos from the pictures bellow for example). While I was dancing a Japanese girl pulled my shirt and smiled at me!. I think she was a bit drunk haha! 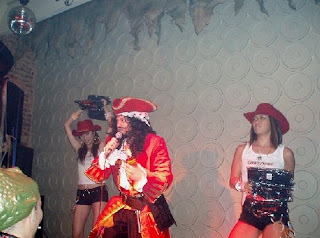 The disco closed at 5 a.m. or so with a guy dressed up as captain hook and to girls giving away some T-shirts with the Pure logo (similar to Puma). When I was going back to the hotel I bumped into my Spanish friend and we decided to go to an Afterhours that was nearby. People in the afterhours were mostly composed of men, some drunk women and some blonde russians accompanying VIP people. I was probably the only one sober so I felt like an objective observer hehe. When I got back to the hotel it was 8 a.m. and the checkout was at 10 a.m. so I couldn't sleep to much either!.